Water: is both a solvent and a buffer in ecological problems. The sands, gravels, muds and boulders of Long Island, New York are actually a terminal moraine of a glacier that once stood over a mile thick on the Hudson River during the last ice age. The porous sediments of the island contain a good deal of that meltwater and the rainwater and snow that fall on Long Island Sound every season. 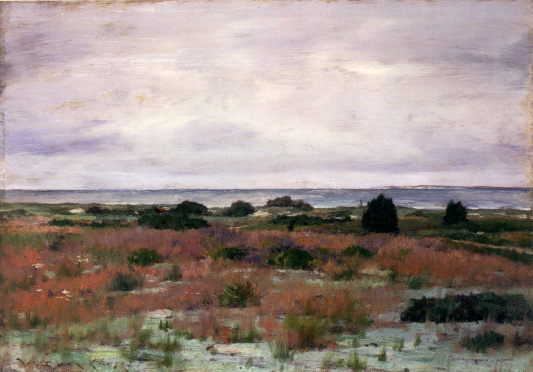 Chase was the founder of the first professional American school of outdoor painting on Long Island. The Shinnecock Summer School of Art was started in 1891 and continued until 1902. Subsequently, Chase continued classes abroad and around the country and concluded his teaching in 1913---just three years before his death. Because water dissolves soluble materials it can eat away at and wear down even rocks and metals. 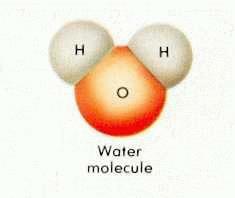 Water also contains chemicals to moderate the acidity or alkalinity of materials dissolved in its fluid solution . Water shapes the land as it moves from the air to the ground and seeps deep into the earth as it moves to the sea in a closed cycle. This is the hydrological cycle of evaporation, condensation, precipitation (rainfall, fog, dew or mist), runoff, ground water recharge and transpiration. Why we must educate ourselves about water. "We all live downstream on round river." As Aldo Leopold reminded us, by that statement we are all part of a generously renewing cycle of life. Leonardo Da Vinci said that "water is the driver of life." We in the south know that water is nature's heat shield because it is our temperature and chemical buffer and our essential ingredient. We use water in our air conditioners, we need water to create electricity and we pump water from place to place with electricity. We must have water to nourish our families, protect our health and beautify our surroundings. All living things are largely made of water. Marjorie Harris Carr and Marjorie Stoneman Douglas had a vision for Florida that we embrace today and pledge to promote a water ethic. They believed we needed to restore our scenic beauty and wildlife by protecting our waters. They knew that clean water is the key to our diversity of population and the diversity of our forests, natural areas, wild creatures and enormous fisheries. We dare not neglect water quality. But, we are building roads over our water recharge areas, dumping sewage and septic ooze right into our rivers, lakes and lagoons and over fertilizing our landscapes so that lakes and streams choke on the runoff. To protect ourselves we must keep our air and water contaminant free. As our drinking water supplies shrink we must conserve water, enforce high quality standards for water use and reward those who reduce their waste of this vital source of health and human security.  Water is a necessary element that must be fit for human consumption; so water must be pathogen and contaminant free.  Water quality and quantity must be sufficient to nourish fisheries and sustain healthy wildlife populations.  Water must remain a public good and a common property resource, because it is needed by all citizens.  Water is wedded to the scenic beauty and landscapes that are a magnet for visitors.  Water symbolizes the redemptive promise of baptism and many sacramental rituals across numerous faiths. For us to develop, promote and practice a water ethic is of primary importance for this new century. Water is necessary to sustaining our lives. 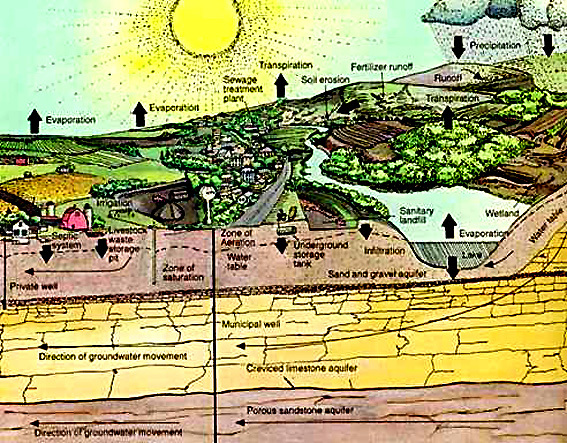 Any landscape is but a thin cover for a life-sustaining aquifer hidden below the surface. What is the ecological problem? Other pages about water on this site are . . .